Create Send UK | How to personalize an email campaign? We allow you to personalize the subject line and content for each campaign you send. By adding any of the following tags to your subject or campaign content, we will dynamically change these values for every recipient when sending the campaign. When personalizing a recipients name, you can provide a fallback value which is displayed if that field is empty for that recipient. If you would like nothing displayed when a recipient's name field is empty, simply leave the fallback value blank (e.g. [firstname,fallback=]). As well as personalizing your campaigns with variations of name and email address, you can also add any custom fields you might have set up for a subscriber list. Please note: You can personalize your campaign content with custom fields, but not your subject. The subject personalization only supports the different forms of name and email address outlined above. 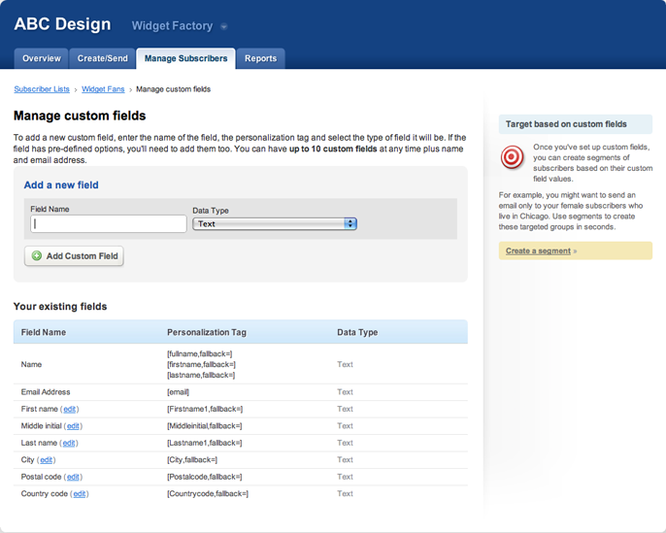 When adding a custom field, you can specify a personalization tag for that field. Whenever you add these tags to a campaign and send it to that list, those fields will be populated with each subscriber's information. Just like name and email address, you can provide your own fallback terms for these custom fields, using the same fallback code (e.g. [address,fallback=]). You can use our simple tag to generate a personalized link to a web based version of your campaign for every recipient. This means that even if they're viewing the web version, we still track how many times they checked it out, what links they clicked on, etc. In your HTML code, just use the tag <webversion>Type your link text here</webversion> and we'll do the rest. Learn more about the tag.